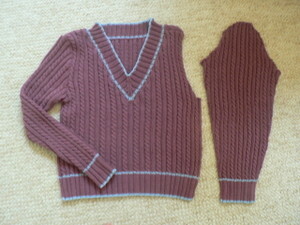 The completed Vogue Tennis Sweater. 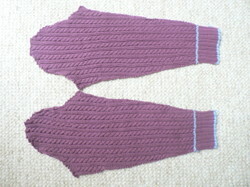 Modifications: I lengthened the torso by a few inches, and also the sleeves. Retrospectively, I probably could have gone one more inch on the torso, and one less on the sleeves. I also picked up the stitches around the color with the main color, then switched to the contrast color, rather than just picking up the stitches with the contrast color. Oh yeah, and a three-needle bind off at the shoulders - I never cast off shoulders, if I can help it. I can taste the F.O. I had to look back in my archives to see exactly when I started this sweater - if it's any hint, the pattern comes from the Spring 2005 issue of Vogue Knitting. March. Not last March, but two Marches ago. Most UFO's that stay UF'd for this long end up in mothball heaven. But the preppy in me has kept the love alive for this pattern, and here we are, three seams away from being completed! The body looks a little rotund, but I think that's mostly an optical illusion due to the skinny skinny arms, which stretch when worn. PS Notice that I have actually had enough knitting going on that I have not had to put in gratuitous baby shots? Awww yeah! I have not knit a sweater for myself since my very first knitting project. And I love to knit sweaters. But I usually like to knit for others better than for myself. But I saw Debbie Bliss' Tennis Sweater pattern in Vogue and just loved it. I knit like a maniac in the beginning (don't we always start projects that way? )...and then, well, got distracted, and pregnant (so I figured I wasn't going to be able to fit into it if I finished it, and therefore it could wait - you know, that dangerous thought process that leads to UFO's lingering about for decades). But last night I finally completed the sleeve cap for the last sleeve! As for the vacation knitting project, I bought some Cascade Fixation for some socks. I don't usually make socks, and I've never used C.F., so it should be interesting. I was also looking for a good top-down raglan women's sweater pattern, that has shaping around the waist...LadyLungDoc already suggested this one. Anyone else got a suggestion? Oh, oh, and I also bought Brown Sheep's new entrelac baby blanket pattern - thinking about using Mission Falls cotton for it. It's such a pretty blankie! Knitting Packed.......you better believe it, baby! "Fall Break" is a concept unfamiliar to medical students. But then again, it has the word "break" in it - and not referring to a bone or other body part, so of course we don't understand it. And that is why I love being a dual-degree student - "Fall Break" has been my one week off in October for the past two years, as I have been working on the MBA-part of my degree. In fact, if I remember correctly, this so-called "Fall Break" was when I started my blog last year. Ah yes, the joys of being a (non-medical) student. Now, I have blabbed on and on about the softness of Peter Pan Velvet Touch, and yadda yadda yadda about the softest blankie I am knitting...but this is the first photo I have shown. I wish you could just reach out and touch it (hey, wouldn't it be great if we could feel each other's fiber...rrrrrrrr). I even may have tricked you into thinking it's done (ha, folded up, suckers! ), but I do have one more solid pink edge to finish. This project did not make the cut-off for the trip, though - why spend precious alone-and-quiet knitting time on mindless projects? Gimme complicated, I say! On the other hand, remember our lovely Vogue tennis sweater and my first foray into the world of GGH? A front done, a back done, and a sleeve done...and I have no excuse for why this one hit a brick wall for the past four months. (Well, except that I can always convince myself that if I finish it, it's not like it's going to fit now, anyhow...but that is not excuse, I know!). So, sleeve #2, you will be longer by the time I get back! Heck, you may even be finished! After all, this is really a pleasant cabling project. Oh no, you didn't think I was going to go down some philosophical speech route, did you? So, tonight I got home, and I knit. I worked on my Debbie Bliss tennis sweater from Vogue Knitting. And if I can just get the front done before the weekend, all I have left to do is a sleeve - doable in one three-day weekend, wouldn't you say? Here's my progress...think if I push through I can finish this baby up? I really like it - but now I am totally stuck on what scarf to make for the bride, and what hats! If you have any ideas/suggestions, my knitter's block would greatly appreciate it. Well, this is it folks. This crumpled up piece of knitting is all I have accomplished. Frankly, it's amazing how little knitting I have done in the past few weeks. I'm not quite sure why...perhaps knitting provides some kind of stress relief during the school year that I don't crave as much during the summer. Or maybe my job is keeping me busier than I think. And look, I have been so delinquent, this whole paragraph is pink and underlined, and I can't fix it. Hmph. That being said, I am still keeping up with your fantastic blogs, and I am going to jump back into the swing of things (especially since I am at the point in the project, where, you know if you put it down you won't remember what you did or what modifications you made etc...). And one piece of advice: if you ever get a chance to make your own ice cream from fresh strawberries...DO IT! Oh Crap. Crappy-crap-crap. Yep, that is the nice version of what I was really thinking when I pulled out the front of the tennis sweater on the airplane yesterday - and I realized - I had never switched to US5's after completing the ribbed section on the bottom in US3's (see photo in post below - the front looks the same as the back). I have no photos to show you, because I am in DC right now, and I also did not bring much alternate knitting. Eesh. But now I have to decide - rip or no? I've done probably about 5 inches (which is a lot of time) on the 3's. I guess I will not be able to make that call until I compare the front to the back. This blows. But on the grand scheme of things - a mistake in knitting is quite small. Knit-a-Bit is the name of an LYS in Chapel Hill, owned by a really really elderly lady who always shows me how to do something faster or better (she taught me the trick of knitting two sleeves simultaneously). I do not get to go there often, because her hours are fairly, well, geriatric, and I am usually not available during the day. But I bought some addi's from her this week, and it always makes me feel good to support a local store. The light wasn't great when I took this shot, but you get the gist. This is going to be a great sweater, I can feel it. Otherwise, Lola #1 (in yellow) is being blocked, and Lola #2 (in turquoise) is on the needles. And I will show you a photo soon, but I think I'm giving up on the Baby Raglan Hoody - not entirely - I just don't really like how it's turning out with the Koigu. I also took advantage of the Spring Sale at Woolwinders, 30% of Debbie Bliss Cotton Angora led me to a 12 skein purchase of it in "wine." It's more purple than I thought from the web colors, but that may be okay. Another hectic week coming on, but hopefully I will get a post out some time this weekend with more progress. Happy Knitting!